As a Wall Street Journal editorialist just after the Sept. 11 attacks, Claudia Rosett had a novel assignment: writing about the world's dictators. Dictators were falling with such regularity, however, that the veteran journalist jokes that she wondered if her beat was doomed. That is certainly not the case today, when there is no shortage of up and coming dictators. New members of the dictators' club such as Vladimir Putin have seized power and repressive regimes are on the rise. Retrenchment by the United States has reduced the incentive for these powers to behave well on the world stage. "After World War II the United States was the bulwark of freedom. America has been retreating and, because of this, we are heading into a very bad period," Rosett says. "The world situation has not been more dangerous at any time since the collapse of the Soviet Union," she continues. "We are seeing the rise of undemocratic powers of various kinds across the spectrum and that is incredibly dangerous. It really mattered that the United States was able to say 'You can't get away with this. This is a red line.' But we have squandered that credibility." What makes her bleak assessment worth taking very seriously is that Rosett has loads of credibility. She joined the Wall Street Journal in 1984, first on the editorial staff and then as a reporter--a rare move as opinion writers usually don't switch to the news side. She has served as editorial page editor of The Asian Wall Street Journal, as a reporter promoted to bureau chief in Moscow, and as a member of the Journal’s editorial board in New York and columnist for The Wall Street Journal Europe. She won an Overseas Press Club Citation for Excellence for her reporting on the ground at Tiananmen Square in 1990. She broke the in-depth story of North Korean labor camps in Russia's Far East. It is not surprising that Rosett developed an interest in foreign affairs. She was born in Connecticut, but her economist father took the family abroad for a sabbatical and when he was setting up the doctorate program in economics at the National University of Taiwan. Claudia played in the back alleys of Taipei and went to school in Holland. "My parents just threw us in a Dutch school. When you are eight years old and in a Dutch school, you learn Dutch very quickly." A visit to Hong Kong made a particular impression. "I am coming back here," the young Claudia vowed. She did as a Wall Street Journal writer. Rosett came to the attention of the Wall Street Journal in an unusual way. She had been hired by Adam Meyerson to be managing editor of Policy Review, a magazine then published by the Heritage Foundation and edited by Meyerson. The Wall Street Journal book editor had sent Meyerson a book by Dr. Seuss to review. It was a book for children, about nuclear war. How do you review a book like this?, Meyerson wondered aloud. Easy, said Rosett, who had majored in English at Yale and gone on for a Masters from Columbia: in verse. In a generous move, Meyerson handed off the book review to Rosett, who did indeed write it in Dr. Seuss-like rhyme; the result was so successful that it led to an interview at the Journal. She has won the Eric Breindel Award for Excellence in Opinion Journalism, which is awarded for "Love of Country and its democratic institutions as well as the act of bearing witness to the evils of totalitarianism," in 2005 and the Center for Security Policy bestowed upon Rosett its "Mightier Pen" Award the same year. She has been a resident journalist at the Foundation for the Defense of Democracies. She is currently foreign policy fellow at IWF, a columnist for PJ Media and Forbes online, and a contributing editor to The New York Sun. The U.N. Oil for Food program, we learn from the reporting of Claudia Rosett in The Wall Street Journal, was a rip-off on the order of $21 billion -- with money intended for hungry Iraqis going instead to Saddam Hussein and his henchmen, to bribed French and Russian businesses and, evidently, to the U.N.'s own man in charge, Benon Savan. One of the few reporters to delve into the murky inner workings of the massive bureaucracy known as the United Nations, Rosett has been critical not just of the U.N. staff, but of the world leaders who flock to New York for U.N. events. When the U.S. State Department called last year's ceremonies for the opening of the U.N. General Assembly “the largest gathering of heads of state ever assembled,” Rosett countered that "historic, however, is the procession of high-profile despots planning to appear in person" at the U.N. She wrote in Forbes that the debate featured "a lineup starring the presidents of such notorious tyrannies as China, Russia, Iran and Cuba. . . . [D]espots who bestride such countries as Belarus, Turkmenistan, Zimbabwe, Kazakhstan, Qatar, Ethiopia and Gabon" were also present for the U.N. festivities. The headline referred to the U.N.'s "parade of dictators." Was it inevitable that the U.N. would turn into such a gathering? And can such a lineup of rogues contribute to the peace and wellbeing of the world? "When Iran violates umpteen rounds of binding sanctions resolutions," she continues, "there are no repercussions within the U.N., because the member countries are supposed to police themselves. At the U.N., Iran gets all the privileges accorded to other member nations while these violations are going on--and they are still going on, they are still testing ballistic missiles. Iran while under U.N. sanctions has held seats on the governing boards of more than half a dozen major UN agencies, and currently heads one of the largest voting blocs in the U.N. General Assembly — to which U.S. taxpayers contribute 22% of the budget. In other words, you have a system whereby law-abiding countries that are members will be held to account by their own citizens, but dictatorships will not. From the day Stalin sat down to help found the U.N., you have had a vehicle that lends itself to exploitation by the worst governments." Comparing the current U. N. ambassador to the late Jeane Kirkpatrick, who upheld U.S. values and interests during her time as ambassador to the U.N., Rosett calls Ambassador Samantha Power "a disaster." "She has crossed t's and dotted i's and speaks passionately and so on, but what has come out of her tenure? She came in saying there would be no more genocide but look at the carnage in Syria. When President Obama sent the Iran nuclear deal to the U.N. before Congress had any chance to debate the contents, it was Power who introduced it and led the vote. An ambassador who respects the U.S. constitutional process would have said to her boss, 'Sorry, I won’t present this Iran nuclear deal to the U.N. in what amounts to an end-run around the elected lawmakers of the American people.’"
Asked if the United States should remain a member of the United Nations, Rosett doesn't hesitate. "No," she says. But extricating ourselves from the U.N., even if we had leadership inclined to do so, would require super human determination. "It would be very hard to get out of the U.N.," she explains, "because it is enormously entwined with all sorts of conventions and policies and, perhaps more to the point, because of vested interests. There is a whole policy establishment around the world, especially in the U.S., who are used to dealing with the U.N., who are used to getting consultancies with the UN, or have held prominent positions with the UN. It is a monster that was created after World War II and, unlike the failed League of Nations, it was . was hooked up to the spigot of required U.S. dues and hosted in New York." The U.S. government also increasingly turns to the United Nations to make end-runs around the proper legislative channels — as it did with the Iran deal, and is doing with climate change and attempting with the push for a ban on nuclear testing. Climate change, says Rosett, is the U.N.’s preferred vehicle to impose central planning on the world's productive nations. Given the labyrinthine structure of the U.N., with its concentric circles of agencies and partnerships, it is impossible to figure out what the United States contributes every year. "The answer is we actually don't know. You and I don't know--in fact, we cannot know," Rosett says. It is this hidden budget that leads to "all sorts of corruption." The U.S. contribution may be double digit billions. "I can send you a chart of the UN which makes a great place mat--it is complicated beyond belief at this point," Rosett says. Rosett believes that the U.S. and allies would accomplish more with smaller alliances built around real shared interests such as NATO. When it is remarked that NATO was "toothless" during Russia's recent encroachments into the Crimea, she points out that "NATO wasn't toothless during the Cold War and it is not toothless when the United States leads." She jokingly says that there would be no harm in "renting a gym in Topeka, or maybe Russia’s Novosibirsk, as a talking shop and calling it the U.N." As long as there is no budget--the budget, largely amounting to an entitlement bankrolled by the developed democracies, is the "fatal element" in the U.N.
After doing "one live story after another," Rosett may at last be doing a book on the United Nations. 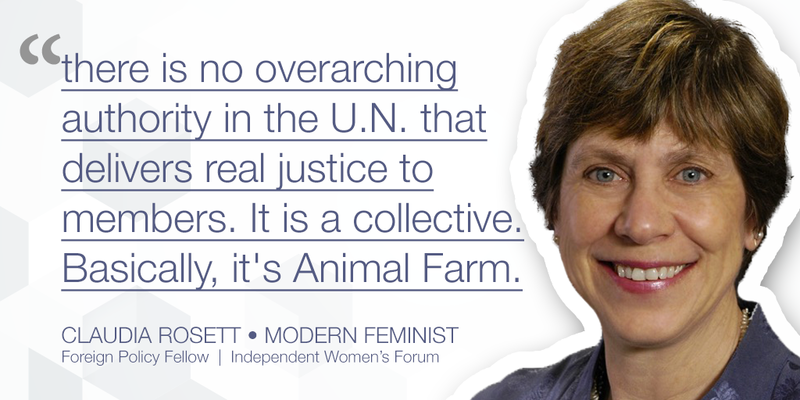 It should be eagerly awaited--Rosett is one of the few journalists willing to tackle the U.N. in all its monster complexities. She lives in New York State with her husband, a retired British military officer. Unlike many conservative journalists, Rosett was never on the left. There's no conversion experience. "Being on the left looked romantic and like a lot of fun, but I never could buy into it," she says. She says that her philosophy is summed up in the motto of the famous Wall Street Journal editor Robert L. Bartley: free markets and free men. She laughingly says that maybe we at IWF should adapt the slogan and make it "free markets and free women." Even without adjustment, the sentiment makes her a perfect fit for IWF.